I have often described Sodus Point to friends as “a quaint little drinking town with a fishing problem”. I am only partially joking. Just walk downtown by the restaurants on Saturday night and you will see what I mean. From what I have read our village has always been that way. One of the first buildings constructed was a tavern. As a historian, I wondered how our village coped with Prohibition which was in affect by law from 1919 to 1933. I have recently found out that our Village was a “dry” village prior to Prohibition largely due to the Temperance movement. Curiously enough, there is little locally written on this topic. To learn what Prohibition was like here in Sodus Point, my wife and I interviewed Stuart Balch who was born in 1927 and currently lives on Margaretta Road and Pear Rook (age 90) who has spent the last 85 summers in a home on Crescent Beach just east of Charles Point. Stuart may have lived longer in Sodus Point than any other resident. I remember quite a bit about this. 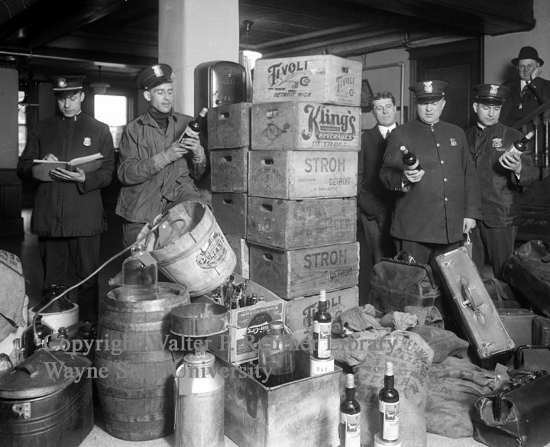 Smuggling and selling liquor during Prohibition was quite widespread and profitable in Sodus Point and the surrounding area. I remember there were families that bought farms from the money they earned doing this. As a kid, I lived for a while at a house on the corner of Halcus Road and Lake Road, near Maxwell Creek. They smuggled in liquor at Maxwell Creek and at the Sodus Fruit Farm. The smugglers would unload their goods at night. No tunnels were involved. I recall that my Mother played the piano and my Farther played the fiddle at dance parties where they sold liquor during Prohibition. It was one of their jobs during the Depression. They were paid $1.50 per party. Parties were held in barns or in houses where they would move the furniture outside to make room. One time one of these parties was raided and my father leapt out a window and lost his fiddle. There was a lot of “boot legging” from across the Lake but also a lot of local farmers made their own booze on stills on their property. One of the local farms had a little chicken house but it was not used for raising chickens. It had a still inside! The moonshine was made out of hard cider, apples or corn. He would put a jug of his moonshine inside a wooden crate and would pack apples around it and over it completely hiding the jug. He would take this to the Rochester Farmer’s Market and customers would buy it asking for the “special” apples. I remember the little house that is now referred to as the “Fisherman’s Cottage” on Lake Rd. (across from the cobblestone house at Maxwell Creek) being lived in by people that made “white lightning”. When the father moved out of the cottage and the son was moving in, I helped him clean it out a bit and we found some liquor in the basement. It was smooth to the taste and clear as water, but powerful. I was 20 years old at the time and I passed out within a half hour of drinking one glass of the stuff! In 1933 beer came back and was now legal. I remember it coming back at the Franklin House. Another long time resident of Sodus Point is 90 year old Pearl Rook. She has spent the last 85 summers in a home on Crescent Beach which is the narrow strip of land separating Lake Ontario and Sodus Bay east of Charles Point. I have lived on Crescent Beach during the summer since 1925. As a young girl, I remember that during Prohibition boats would come across from Canada bringing liquor and beer. They would arrive at night and beach on a sandbar on Crescent Beach. Local people always seem to know when they were coming. They sold their wares right from the boat and did a great business. Bill is a well known photographer and life time resident of Sodus Point. He tells two stories about rum running on the bay. One area that was active in rum running on the bay was the area where second creek comes into the bay. The 1/4 mile area which is marshy and very low is known as the “flats”. People used to light lanterns to signal the rum running boats. One lantern meant it was unsafe and two lanterns meant the coast was clear and safe to come in. Because second creek was shallow, small boats would offload the booze and then bring it into second creek. The primary landing point was the last cottage near the marsh. The booze would then be distributed to Emerald Point, Rhythm Hill and the area near Alasa Farm. He related another story that during prohibition there was a couple of boathouse’s between what is now Captain Jack’s and what used to be the Dolphin. 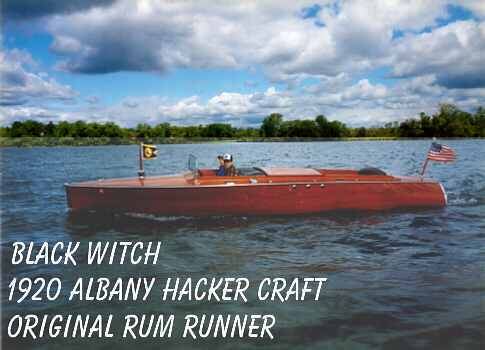 Rum runners would come into the Bay (usually at night) and pull right into the two boathouses. They would then unload their booze there out of sight of prying eyes. Next door , Joe’s Place would then apparently sell it. See next story. Another prohibition story comes from Tom and Brenda Frank who are the current owners of Captain Jack’s Goodtime Tavern. They obtained an old poster of the Sodus Point Fish and Crab House from the 1980s. It was formerly Joe’s Place, The Dolphin and Captain Kelley’s. This what is said on the poster about Joe’s Place: “Joe’s Place operated as a hotdog stand in the 1920’s. It was also said to be used as a “Speak Easy” during Prohibition”. I have heard several stories from local residents about Joe’s Place as being a rowdy place in its day and being used as a “Speak Easy” during Prohibition would not surprise me at all. 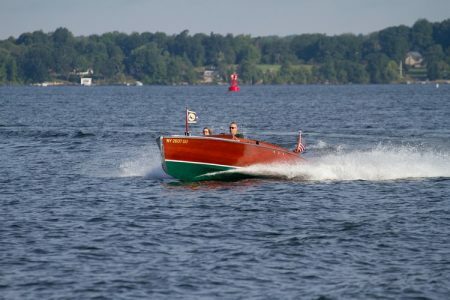 The boat runs as good as it looks and was used to transport what ever booze they could get from Canada to The United States and it was head quartered in Sodus Bay and that one of its delivery destinations was Sodus Point. The small 8cyl Hemi Engine puts out 150 hp which moves the 25′ vessel along rather nicely. Bruce claims she does 32 mph with 7 people on board. He also tells that as a rum runner it was never caught because nothing could catch it at the time. Bill Huff recently talked with the owner and got additional information. The current owner of the Black Witch found it decomposing in a storage building upside down in a stack of straw. He spent a lot of his own time restoring it back to mint condition. While rum running, the seats are very easily removable which made room for the booze. One of the interesting items is that it originally had was a siren and a search light. How they were used is anyone’s guess. On August 11, 2018, Syd Marsden brought the Black Witch back to Sodus Bay at the Yacht Club’s antigue boat show. He was kind enough to give my wife and I a ride in this beautifully restored boat. Video courtesy of Rosa Fox. 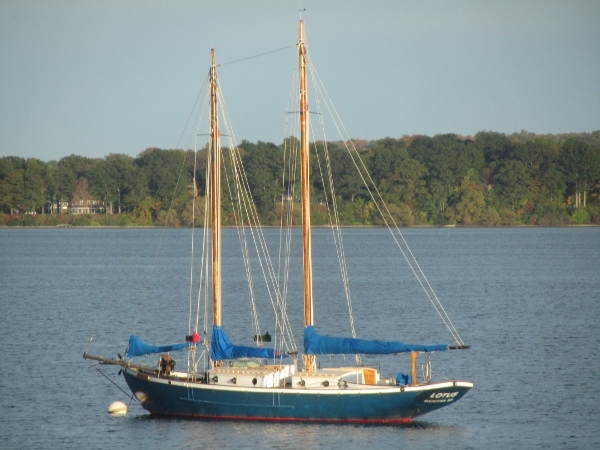 A common sight in Sodus Bay on a summer day is the schooner “Lotus”. We know it today as the vessel used by the Sea Scouts for their organization. During Prohibition, according to a local resident Laurie Hayden. it served a very different purpose. Inside the vessel was a secret compartment that was used to smuggle booze from Canada on frequent trips across the lake. 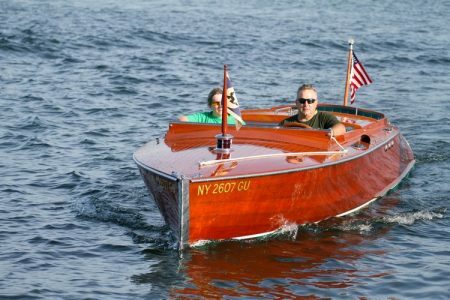 The “Martimas”, a 45 foot power cruiser with a 12 foot row boat resting on it’s stern, was seized after it was used as a rum runner by it’s owner, Ben Kerr, in Rochester. 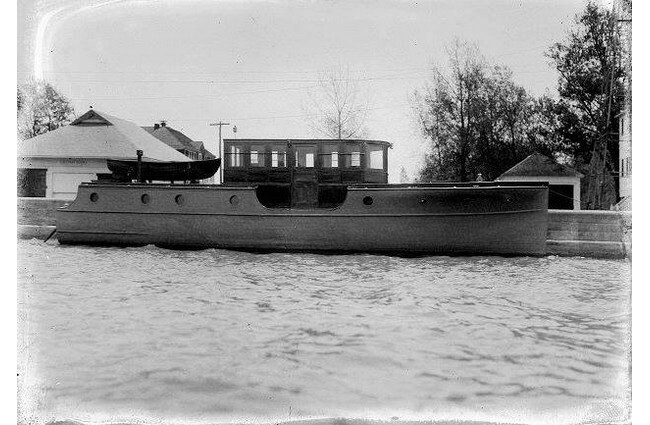 Kerr, a Canadian, ran a smuggling fleet of three boats, including the “Evelyn”, a “beautiful open speedboat trimmed in mahogany”, the “Sparkley”, a 36 foot twin engine launch, and the “Martimas”, which he captained himself. Kerr serviced speakeasies in Rochester, Sodus Point and Pultneyville. He had several rules: he refused to land on American shores, frequently changed his drop days, and refused to travel under a full moon, preferring dark, foggy, or hazy nights. For protection, “Martimas” carried a .45 calibre revolver, a 12 gauge shotgun, and a repeating Winchester rifle. “Martimas” carried whiskey, but predominately beer, and could haul as many as 1,200 cases of beer at a time. At that time, beer came in quarts, and a case consisted of a dozen 32 ounce bottles. Cases were transferred to burlap bags, because they didn’t float. The bags were all tied together with a single rope, so in the event they were forced to throw cargo overboard, they could be retrieved later by snagging a single line. Sometimes they tied a floating marker to an empty bag and weighed it down with a block of salt. When the salt dissolved, the marker would float to the surface, making the beer easy to find. Kerr met his fate when a mole in his organization tipped off officials in Rochester. A chase ensued, and “Martimas” was forced to stop when a patrol boat fired it’s machine gun into her hull. The Rochester “Democrat and Chronicle” hailed the capture with the headline ‘KING OF LAKE RUM RING CAPTURED”. The Coast Guard conservatively estimated the “Martimas” to be worth a minimum of $11,000 and the retail value of the cargo at $17,000. In today’s money, his total loss would exceed $650,000. Ben Kerr returned to Canada when bail of $5,000 was posted, and vowed to return to his business venture. Postscript: John Bensley (Ben) Kerr ran out of luck Feb. 24, 1929 when he and an associate set out to deliver a load of beer across the lake. They never arrived. On March 29 Kerr’s body was found floating just off the coast of Lake Ontario near Cobourg. The boat had split in the ice and the two men had been unable to reach shore. 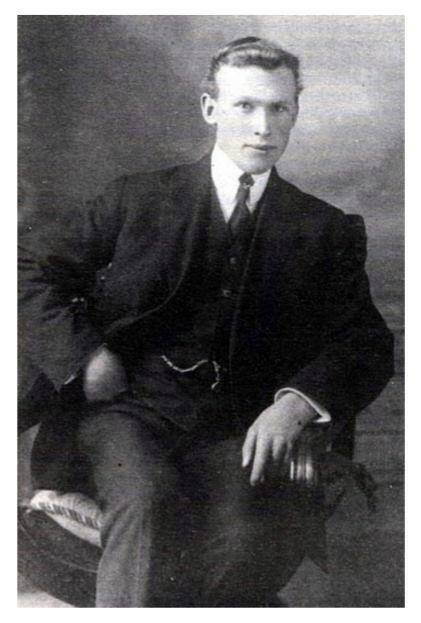 His body was returned to Hamilton, and following a brief ceremony with only family, friends and police observers in attendance, Kerr was buried April 1, 1929 in the family plot. His name does not appear on the marker…..